I used to spend a couple of weeks of my summer vacation at my aunts place in Mettupalayam. My aunt’s husband ran an entertainment club in the 90’s in Mettupalayam. So the cook at the club would make different kinds of evening snacks for people who came in to play cards. My uncle would come home for dinner and he would bring this pakoda for us to snack. It was so good. Whenever there was a party at home, the cook from the club would come and cook. His name was Raju. This pakoda was a must in the menu. There were never leftovers and everyone relished it so much. I never got the complete recipe. 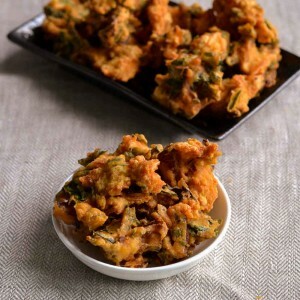 I improvised this recipe based on Neerajas Pakoda Recipe. One thing I remember vividly is him asking my aunt for “sola maavu kudunga, sola maavu kudunga” Sola Maavu or corn flour was not available in Mettupalayam those days. Corn Flour was an exotic ingredient. Yeah! Those were the days! So my uncle would always stop to pick up groceries at Coimbatore. He would purchase things only at one store. It was called Rangasamy Chettiar and Sons. The entire family of my mom clan is a fan of that store and they still talk about how crisp biscuits would come in big tins in the 1950’s from that shop. Back to our pakoda. 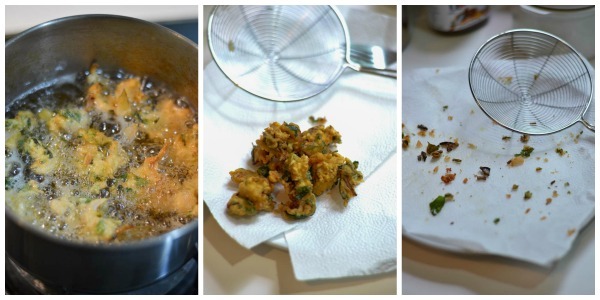 There are three ingredients that make for Tamilnadu style Pakoda. We call it as pakkavada. Its fennel seeds (sombu), curry leaves and onions. The aroma of fennel seeds and curry leaves needs to be predominant in a pakoda. 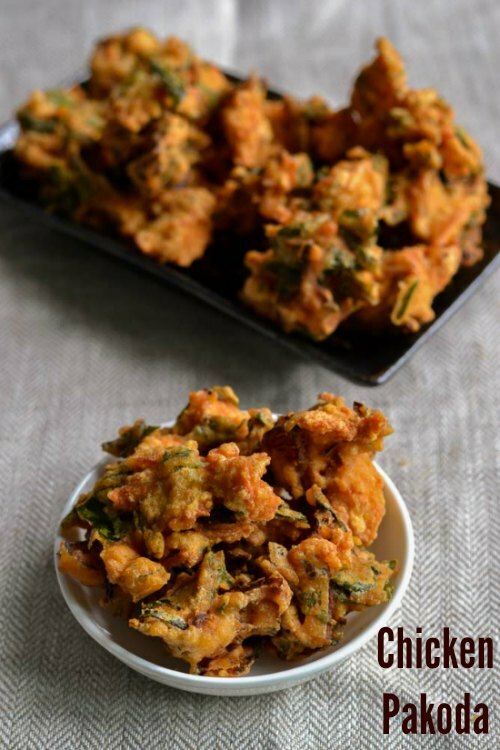 The crunch from the fried curry leaves and its taste is something that makes it uniquely Tamilnadu Pakoda. Now, answer this. 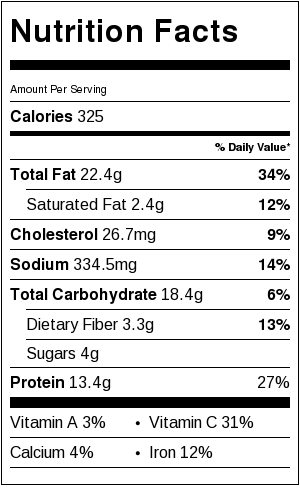 What happens to chicken nuggets if it’s infused with flavour bomb and went to dynamite heaven? It becomes Chicken Pakoda with a Tamilnadu Soul. Here is how to do it. Cut the boneless chicken breast pieces into small cubes. Add it to a big bowl. Add in the fennel seeds, ginger garlic paste, red chilli powder, chopped green chillies and the salt. Mix well to combine. Add in the mint leaves, coriander leaves and curry leaves. Add in the Sliced onions, baking soda, corn flour, besan (kadala maavu, chickpea flour), and oil. Oil helps to crisp up the pakodas while frying. Adding a lot of oil will make it very soggy when frying. So dont add too much of oil. Mix everything well with your fingers and slowly add 3-4 tablespoons of water adding very little at a time. It should be a very stiff, thick batter. Heat oil in a pan until hot. Drop a little pakoda batter into the oil and if it sizzles, the oil is hot and ready. Take little teaspoonful’s of batter and drop them gently in oil. If the batter is sticking to the bottom, gently move it with the help of a fork. If the oil is hot, the batter wont stick. Fry them until golden. As the chicken pieces are really small, they cook in no time. Do not cook for a long time. Cooking chicken for a long time makes it dry. Once the pakodas are golden and most of the bubbles in the oil has settled, remove the pakodas and drain on paper towels. Each batch should take about 3 minutes. We never have leftovers. Its perfect for parties and can be made easily. 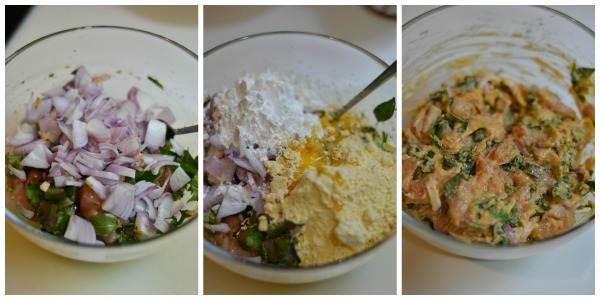 Easy recipe for South Indian style Tamilnadu style Chicken Pakoda. 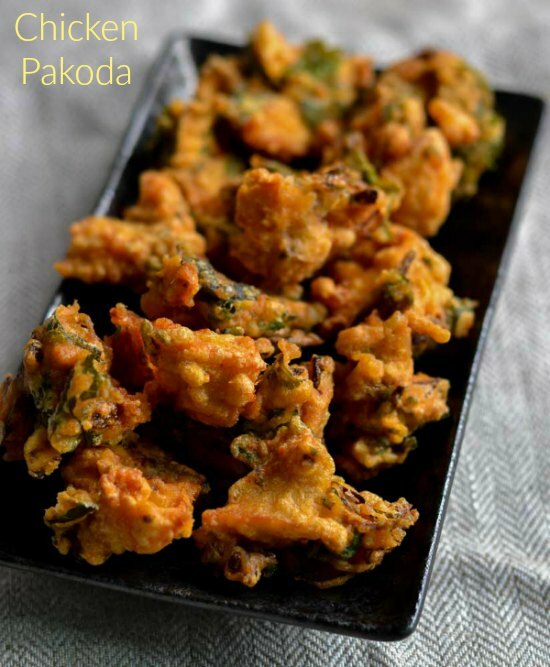 Spicy Chicken Pakoda recipe perfect for parties. Cut the boneless chicken breast pieces into small cubes. Add it to a big bowl. 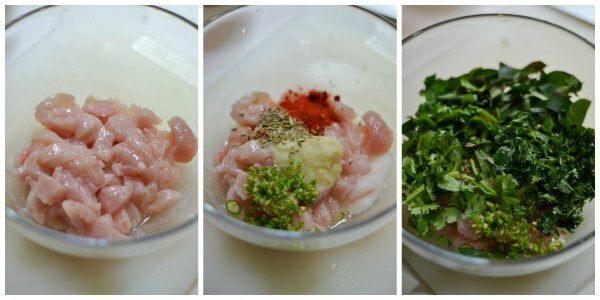 Add in the fennel seeds, ginger garlic paste, red chilli powder, chopped green chillies and the salt. Mix well to combine. Add in the mint leaves, coriander leaves and curry leaves. Add in the Sliced onions, baking soda, corn flour, besan and oil. Mix everything well with your fingers and slowly add 3-4 tablespoons of water adding very little at a time. It should be a very stiff, thick batter. Heat oil in a pan until hot. 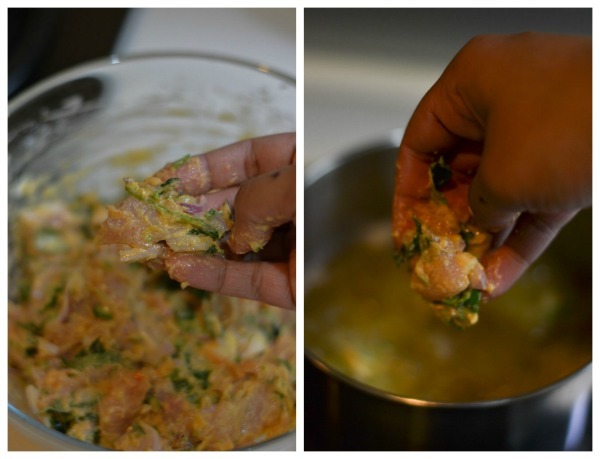 Drop a little pakoda batter into the oil and if it sizzles, the oil is hot and ready. Take little teaspoonful’s of batter and drop them gently in oil. Fry until golden. Drain on paper towels and serve hot! Hi, I like all ur recipes.. I am from Coimbatore. Please post our Coimbatore’s roadside masal puri, bhel puri, pani puri and Kalan recipes.. usually everyone posts north Indian methods. Pls post our Coimbatore roadside shops recipes.. thank u. Thank you Dhivya. I will try getting them if possible. Thanks. Thank you so much Bhavani! Hi,i like all ur recipes. It kindles my child hood memories, especially Cbe based recipes coz i’m also from the same area.My town’s the famous dollar city Tirupur.Best wishes for you. Thank you so much. Really glad that you liked it. Nice to know that you are from Tirupur.